The K-12 initiative leverages AIChE's Volunteer Base for enhanced and expanded local impact in K-12 Outreach. Our objective is to increase interest, awareness, and excitement for science and engineering in K-12 students and prepare future engineering students and professionals to creatively solve technical challenges in an ethical, environmentally responsible, and socially conscious way. The Societal Impact Operating Council is leading efforts to define how chemical engineers can most effectively address societal needs. Accountabilities include outreach and public policy, diversity of the profession, and the global business environment. On February 1- 2, 2019, Villanova University along with CCPS held a very successful Student Process Safety boot camp. The AIChE Foundation supported the travel of 28 AIChE undergraduate student members from Minority Serving Institutes (MSI) to attend the 2018 AIChE Annual Student Conference in Pittsburgh. In 2018, Air Products became the first corporate donor to support AIChE's LGBTQ+ & Allies endowment fund. The gift was arranged by Dr. Roger Whitley, a Distinguished Engineer at the company. In this episode of the Foundation’s Doing a World of Good podcast, you'll meet Allison Berke, Liz Specht, and Elliot Swartz of the Good Food Institute, and learn more about the development of plant-based and cell-based meat products. Help celebrate and advance inclusiveness by attending societal impact sessions at this year's spring meeting. 2015: Thank you for doing a world of good! 2015 was a record-breaking year for the AIChE Foundation thanks to the generosity and support of over 3,431 loyal donors. Neil Yeoman speaks to the VLS about his experience working to help educate the general public about scientific issues that cross over to the political arena. Daniel Sujo and Experience Nduagu speak about their experiences immigrating for work, and share advice for those both working abroad or who have teammates from other countries. AIChE Fellows - Who, Why & How? This webinar is designed to give participants general techniques on preparing and delivering effective messages for the public. Can Accreditation Help Engineering Schools Develop Leadership Skills? As part of this event, WIC presented a panel discussion geared towards pre-college women describing some of the amazing opportunities for women to have impact as chemical engineers. K-12: Unique Contributions Through AIChE and How YOU Can Get Involved! In this episode, you'll meet Tony Butterfield, Stephanie Farrell, and Gayle Gibson, three of our members focused on raising awareness, offering support, and creating dialog for issues relevant to LGBTQ+ individuals within our profession. In this episode of the Doing a World of Good podcast, you'll meet Amita Gupta and Sujata Bhatia, two fascinating women using their considerable talents to help radically transform the medical and public health sectors. In this episode of the Doing a World of Good podcast, you'll meet Nance Dicciani, Ruby Chandy, Kim Ann Mink, and Suzanne Rowland, women who have contributed to the advancement of both chemical engineering and the business world. Listen on the Giving site or subscribe in iTunes. In this episode of the Foundation’s Doing a World of Good podcast, you'll meet Gilda Barabino, Christine Grant, and Paula Hammond, all of whom are active in AIChE’s Minority Affairs Committee. Listen on the Giving site or subscribe in iTunes. This podcast is supported by a generous donation from Raj & Kamla Gupta. In this episode of the Foundation’s Doing a World of Good podcast, you'll meet Kelly Barb and John Cirucci, co-chairs of AIChE's Global Social Initiatives Committee, a working group dedicated to promoting volunteerism and social action within the organization. Listen on the Giving site or subscribe in iTunes. This podcast is supported by a generous donation from Raj & Kamla Gupta. More than fifty exceptional women from companies around the world participated at a Leadership Workshop for Rising Star Women in Engineering. In the first of the AIChE-Doing a World of Good podcast series Raj Gupta, shares a captivating story of his personal and professional journey to become a leader in the chemical industry. Listen on the Giving site or subscribe in iTunes. Thank you for your support. Your generosity has been the driving force to advancing the chemical engineering profession and positively impacting our global society. The Disability Unity Community Convocation at the 2018 Annual Meeting featured a diverse set of panelists with expertise in inclusion of STEM students with disabilities in undergraduate education. 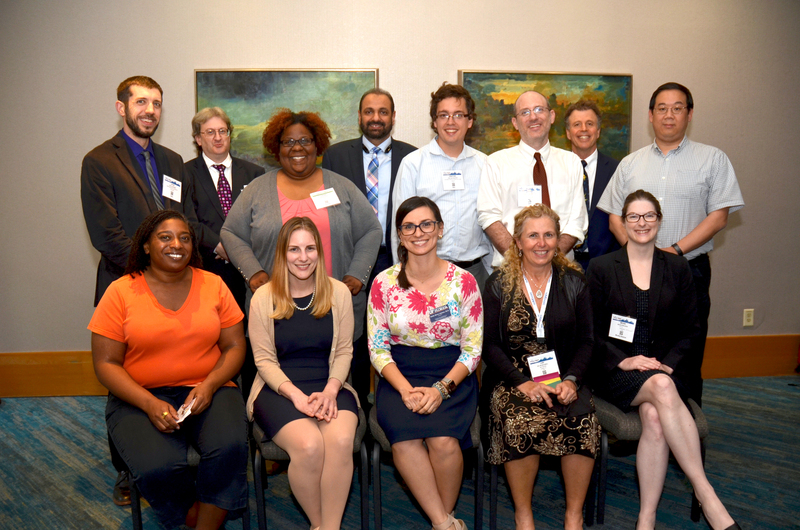 AIChE's Women’s Initiatives Committee (WIC) commemorated it’s 20th anniversary with a day-long special symposium at the Annual Meeting in Pittsburgh. On Saturday, October 27th at the 2018 AIChE Annual Student Conference in Pittsburgh the AIChE Foundation hosted the inaugural AIChE LGBTQ+ Ice Cream Social for students. Research shows that workplace diversity can increase creativity, innovation, enhance decision making, and boost productivity. AIChE recognizes that the best way to lead the way to a safer world is through transforming Chemical Engineering Education.